Strong utility fabrics, such as canvas or denim, work best for a grocery tote. But that doesn't mean they have to be boring! Look for bold prints online so you have lots of choices. This is a durable bag, but as with any kind of grocery bag, try not to overload it with too many heavy items all at once. Make several bags so you can carry the weight evenly. Now, get ready to sew some eco-friendly totes! Note: Always preshrink the fabric so it doesn't shrink the first time you need to wash the bag. Cut 1 (37x14-inch) piece of both the outer and lining fabrics. Cut 2 (15x8-inch) pieces of both the outer and lining fabrics. Cut 2 (24-inch) pieces of webbing for the straps. Mark the centers of the 37-inch edges on the body of the bag. Mark the centers of the 8-inch edges of the side pieces. Pin the right sides of one side of the bag together, matching the center markings of the body of the bag and the sides of the bag. Sew down the sides and bottom of the bag using a 3/8-inch seam allowance. Repeat on the other side of the bag. For extra strength, backstitch the bottom corners. Repeat the same process to sew the lining together, this time using a 1/2-inch seam allowance. Apply a seam finish to the outer bag piece to prevent the raw edges from fraying. Trimming with pinking shears is a fast and easy way to do this. You could also zig-zag the edges, use a serger, or apply a sealant. Measure in 3 inches from the side seam on the body of the bag. Pin the strap in place with about 1-inch of the end of the webbing extending past the raw edge of the out bag piece. Sew across each end of the straps three or four times 1/4 inch from the edge of the fabric. This acts as basting, but it also helps keep the straps secure. With the outer bag turned wrong-side out and the lining turned right-side out, nest the lining in the outer bag. Pin around the raw edges. Sew the outer bag and lining together with a 3/8-inch seam allowance. Leave a 5-inch opening on one of the side areas. Be sure to backstitch at the beginning and end. Finish the seams as you did the others. Push the lining into the bag and press the top seam to open it fully. Make sure that you press the seam allowance of the opening so it is even. Pin around the top. Top stitch around the top of the bag 1/8 inch from the seam and 5/8 inch from the seam. Sew a square or rectangle with an X through each strap end to securely hold the straps in place. 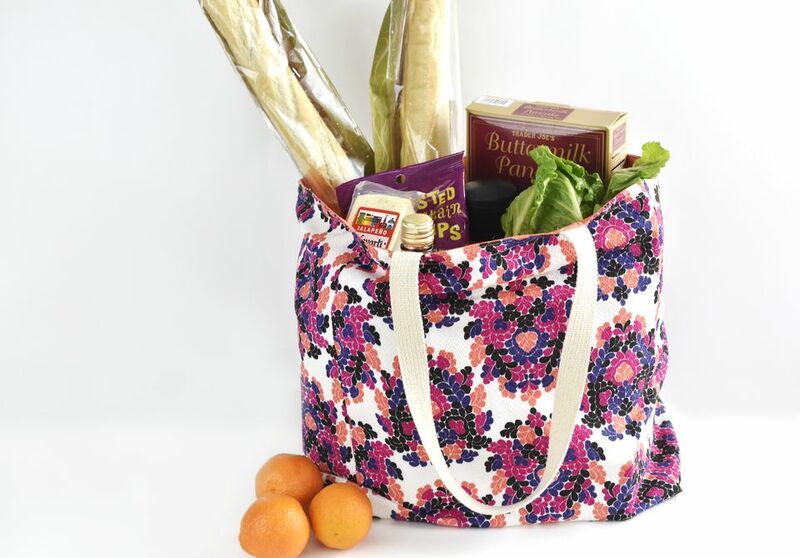 Take your new bag to the market on your next shopping trip and load it up with groceries!